This Firing Range was built during the reign of Queen Victoria, as it is shown on a map of Saundby Parish dated in the late 1880s. 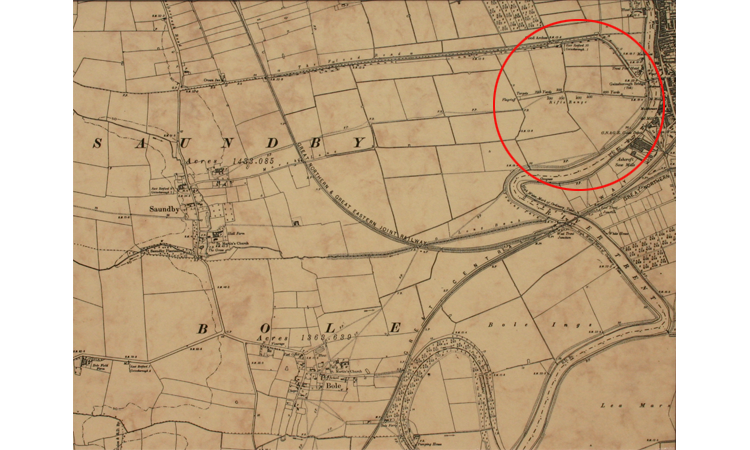 It was situated in the fields on the right hand side of the Old Flood Road (Ramper Road) when travelling from Beckingham towards Gainsborough, about a quarter of a mile from the road, and opposite the hump-backed arched bridge that is there today. There was a high long mound of earth, nearest to Gainsborough, where the targets were placed called the 'Butts'. From there going back towards Saundby, and in line with the road, there were a series of 'Firing Points' where the soldiers would have fired their rifles at the targets; from the Standing, Kneeling, Sitting and Lying Down positions. These 'Firing Points' started at 100 yards from the targets, and went back every hundred yards until the 600 yards Firing Point - at which point the soldiers would have been lying down to shoot at the targets. The map also shows a flagpole on the Range. This would have been used to hoist a red 'Danger' flag when shooting was in progress. Sentries would probably have been stationed on the Nottinghamshire bank of the River Trent to prevent people walking along the bank behind the target area when rifles were being fired towards them.From the date of the map, the Firing Range was probably built for (and used by) the Gainsborough Company of the Lincolnshire Militia Volunteers. This was a sort of volunteer Territorial Army type of locally recruited volunteers - part-time soldiers who were originally formed to counter the threat of French invasion under Napoleon in the early 1800s. 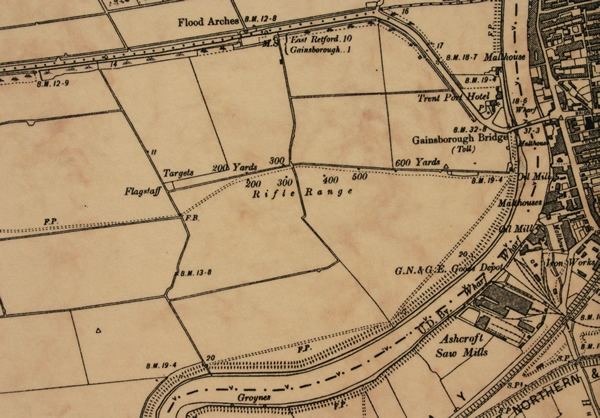 The soldiers would probably have marched out to the Range from Gainsborough, and used a track from the Gainsborough side of the arched bridge to gain access to the Butts end of the Range, although Marsh Lane Saundby would in those days given access to the Range by horse and cart. During the Great War of 1914-1918 the Royal Flying Corps had a landing ground in the Parish of Saundby, in the area south of the Ramper Road (A631) where the Firing Range was situated. They probably used the Butts as a convenient spot to test the .303 calibre Lewis machine guns fitted to their aircraft. In the Second World War 1939-1945 the members of the Beckingham Home Guard may have used the Range for practise with their .303 Lee-Enfield rifles, as may also the members of the Gainsborough Home Guard, the 11th (Lindsey) Battalion; but there is no record of this happening. With permission of the landowner the area was swept by a metal detector in the mid 1990s but nothing significant was found. The Butts were levelled off at about the same time, and the tractor driver was surprised to find many lead bullet heads in the mound! This was the end of the Saundby Firing Range, after a hundred years.